The just-concluded assembly election in the southern state of Karnataka has demonstrated the power, reach, and influence of social media. Facebook, WhatsApp and Twitter are proving to be effective tools of communication to people who in the pre-digital media era did not have an opportunity to make themselves heard. But the social media influenced the course of electioneering in the state far beyond merely providing a voice to the ordinary voter; it actually dictated the agenda of the election campaign. However, much of the social media content has been negative, frivolous and personal, moving the campaign focus away from key public policy issues. In this social media din, no proper scrutiny of the record of the incumbent Congress government under Siddaramaiah could be carried out through the course of month-long electioneering. There wasn’t any campaign attention either on the performance of the Narendra Modi government at the centre, though the prime minister himself led the BJP’s campaigning. The campaign punchlines by leaders quite often mirrored the most trending themes in social media. And they fed election-time controversies which did not have much to do with the issues that concern urban and rural voters alike. As issues got sidelined, the election manifestos too got relegated; manifesto launch by rival parties ended up being just formalities. If at all a manifesto received some attention, it was by way of a social media ridicule of typographical and other silly errors that crept into the Congress manifesto. Why did the campaign assume such frivolous dimensions? Perhaps the reasons are not far to find. Some of Siddaramaiah government’s pet Bhagya schemes – Annabhagya, Ksheerabhagya, etc. – figured prominently in the campaign theme of the Congress. Though populist in nature, some of these social welfare schemes of the Congress government have been quite popular. It may be debatable if these schemes would help securing a renewed mandate for the ruling party, but it certainly provided the theme for a positive campaign (it did not help the party in the Lok Sabha elections in 2014). Specifically for this very reason, the opposition BJP’s strategy did not envisage taking on the Congress on this agenda. 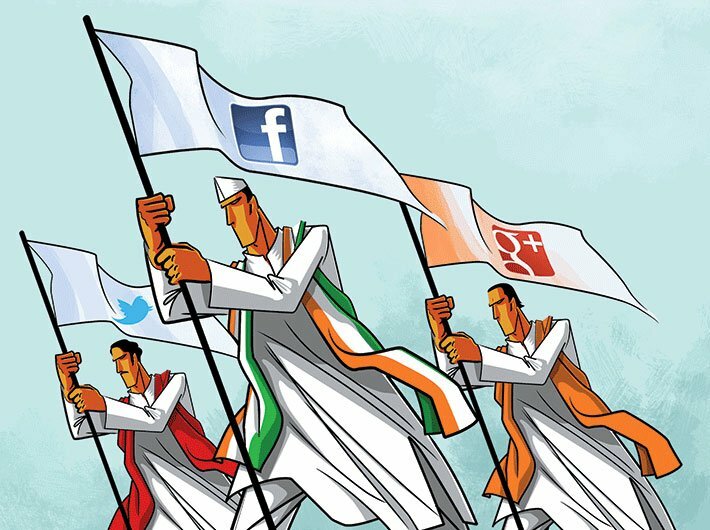 Thus, through extensive use of social media, the BJP and its army of active supporters on social media platforms pinned down the ruling party and Siddaramaiah on some of the more controversial issues during the five-year term – be it the weakening of the Lokayukta institution, the record of senior ministers like KJ George, Mahadevappa and DK Shivakumar, and the chief minister’s advisors like Kempaiaih. The prime minister added his bit to this social media-type campaign when he dubbed Siddaramaiah as the 10-percent chief minister. The social media-led campaign drift suited everyone. Besides Siddaramaiah escaping the adverse scrutiny of his performance, for the BJP it helped deflect attention away from its forgettable five years in office between 2008 and 2013. Ahead of the electioneering, the BJP’s biggest concern was about the possibility of a campaign focus on its term in office and BS Yeddyurappa’s leadership. Indeed, without even any prompting, Yeddyurappa, the party’s chief ministerial candidate, made a point to plead in every public meeting that the people should trust him and give him another opportunity. Obviously, he is aware that the BJP’s last term in office wasn’t inspiring enough public confidence in him and his party for the voters to consider giving another chance at chief ministership. Thus, in the absence of a focussed scrutiny of their respective tenures in office, what with the social media making all sorts of unsubstantiated allegations and counter-allegations, their respective social bases turned out to be crucial in the mobilisation of electoral support by rival parties. However, much as Siddaramaiah and his confidantes would have liked to align their AHINDA (acronym for minorities, backward classes and dalits) plank to the campaign strategy, they realised quite early that it may not yield the desired electoral dividend. Hence their focus on the Lingayat community, which forms the backbone of the BJP’s support base. However, the campaign to wean a section of the community away from the saffron party to support the Congress did not seem to have made much headway. Similarly, the BJP, which is yet to make decisive inroads into the dalit community, made an attempt to woo it ahead of the elections. But this too did not seem to have yielded desired results for the party, as the Congress launched a counter-offensive against the BJP’s alleged neglect of dalits. Both the BJP and the Congress also switched gears to encourage communal polarisation – the Congress to consolidate the minorities in its favour to the JD-S, which too is a contender for the minority support in the state. The Congress reached out to fledgling Muslim political outfits like the Social Democratic Party of India (SDPI) to ensure that they did not split the Muslim votes. This was enough for the BJP to launch a high-pitch Hindutva campaign in parts of the state where it hoped to benefit the maximum from polarisation of the Hindu votes – particularly in the coastal region of the state. One unexpected offshoot of this kind of a campaign is Siddaramaiah’s appeal to the voters in the name of Kannada chauvinism – he projected himself as a champion of Karnataka and Kannada interests. It is doubtful if this has benefited him or the party. It is possible that the Congress might find itself vulnerable on this count in election campaigning elsewhere. A biggest casualty of this kind of campaigning was the irrelevance of Bengaluru in the election-frame of political parties. The city’s myriad problems, caused mainly due to widespread corruption and administrative apathy, did not receive the attention that they deserved. Thus, it was a campaigning in which no party presented a vision for the state or a road map for development. Caste, populism and mudslinging through a hit-and-run social media propaganda based on half-truths and outright lies marked the election campaigning in the state. Subrahmanya is a Bengaluru-based veteran journalist.